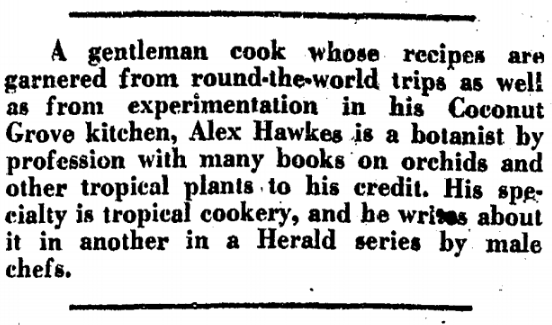 Alex D. Hawkes, his recipes & botanical adventures around the world. Welcome to "Sub-Tropic Cookery"
Holiday Shopping in 1967? Cookbook South Florida Cookery (1964) by Alex D. Hawkes now at all bookstores! 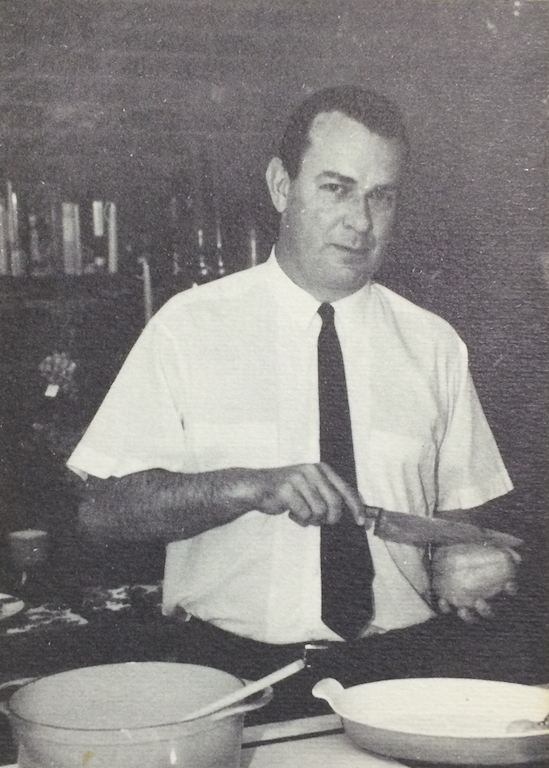 The late Alex D. Hawkes wrote a magical first cookbook, ‘South Florida Cookery‘ (1964). ‘SFC’ was published and hand bound with enchanting cloth covers by Wake Brook House (WBH), local Coral Gables publisher at that time. Alex lived in Coconut Grove, a relatively colorful neighborhood next to Coral Gables. More info about WBH will be linked at the bottom of this post. ‘South Florida Cookery‘ was advertised by The Miami Herald for the 1967 holiday shopping season with the ad seen above. Alex’s cookbook is certainly that, plus much more. The promotional quote, “How To Use Florida’s Glamorous Foods” is both highly evocative and a sign of the times. It was Alex’s time to shine, and indeed he did, becoming one of Florida’s most esteemed cooks. 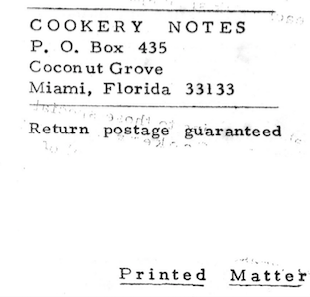 Who else would be keen enough to publish Papaya recipes by non other than David Fairchild, that were enjoyed in his legendary Coconut Grove, retreat, “The Kampong”? Amazingly, the lush botanical oasis on Miami’s beautiful Biscayne Bay has been preserved, and is used for ongoing plant research, and special events. Dr. Fairchild’s recipes will be shared soon. Where have the culinary traditions that once thrived regionally, and across the whole of the United States of America (U.S.A.) gone? The age of convenience has stripped away both a way of living, and also any number of lovely staples that adorned proud dining tables across the country. The countless generations of the cooks in our families that painstakingly perfected and passed these recipes down, must be rolling in their graves! They didn’t have the facility that television and the internet offers, like current generations thoroughly enjoy. The concern at hand is not that we’ve stopped eating or have began to create non glamorous dishes. Among the concerns is that we’ve become increasingly reliant on chefs and restaurants to provide us with these delicious experiences. We look for convenient and simplistic satisfaction when cooking for ourselves either due to lack of experience in the kitchen, or not having enough time. There are other factors and perspectives to keep in mind as well, we do all have to eat everyday. Like many of the great cookbook authors that have strived to influence our eating habits by introducing foreign cuisines to North America, Alex D. Hawkes ranks high in the list of people that influenced the culinary landscape in all of Florida, and the U.S.A.. From Florida’s northern panhandle to the southern tip of Key West, Alex served us with an avid sense of all things botanical that could be of interest to cooks in the kitchen. Alex found himself to be widely useful and well liked by his colleagues in the world of food writing at the time. This is noted through their various citations and acknowledgements made during his lifetime, and thereafter. By presenting delicious recipes from his world travels, using a variety of rare fruits & vegetables that were then just beginning to appear in our markets, Alex helped all those raising their hand or eager to jump into the kitchen to experiment. His botanical background literally left no leaf unturned or nut untasted, which ads something fun and interesting to the cooking experience. Alex Hawkes accomplished something like what Alton Brown, current Food Network TV host that shares scientific and botanical tidbits in his cooking show, has successfully done. Alex exemplified a spirit bringing to mind a cross between Alton Brown, Anthony Bourdain, chef and world traveller, and Julia Child, beloved American author and TV host that trained professionally at Le Cordon Bleu in Paris, a maven for any cookbook author interested in taking on the role of presenting foreign cuisines to Americans. The authors mentioned above all served important roles introducing Americans to the cuisines of foreign lands. Many were American, others were foreign, but in the end they shared a common goal of promoting the positive attributes of the U.S.A. through cooking. A few prominent examples: Julia Child – French Cuisine, Diana Kennedy – Mexican, Joyce Chen & Barbara Tropp – Chinese, Felipe Rojas-Lombardi – Peruvian, Elisabeth Lambert Ortiz – Caribbean & Latin American. 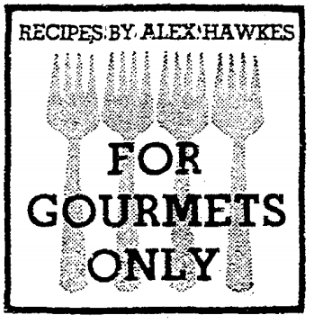 Elizabeth also compiled Alex’s final cookbook posthumously, Alex D. Hawkes – The Flavors of The Caribbean & Latin America: A personal collection of recipes (1977) Viking, New York. There are of course many more such authorities and examples that can be shared. The names mentioned above will help contrast between foreign cuisines and the heritage of the diverse fare that is still alive and well in the U.S.A..
To hook Americans on how rich and diverse our own cuisine was, food writing heavyweights such as James Beard, Edna Lewis, Cecily Brownstone & Jane Nickerson were among those doing their part to help Americans understand, how rich and diverse our ancestors cooked, while promoting the eclectic regional cuisines of the U.S.A.. James Beard covered all of American regional cuisines like his colleague & dear friend Cecily Brownstone who wrote several highly syndicated columns for the Associated Press (AP), over the course of a staggering 39 years. Cecily Brownstone, the most widely published of syndicated food writers, loved to reference Alex’s botanical tidbits whenever she was writing brussels sprouts recipes. We cannot forget Edna Lewis who continued to enamor us with the delights of Southern Cooking. Jane Nickerson who became a Floridian by adoption in 1957 when she handed off the New York Times to Craig Claiborne. Claiborne who had worked with Ann Seranne and Eileen Gaden prior to Gourmet and the New York Times, was an excellent succeeding writer to Nickerson. The fact that all these writers and characters knew about one another, only makes richer the broth, and helps put into perspective what Alex Hawkes was up to. Craig Claiborne would eventually cover Alex in The New York Times of the 1960s. That article will be shared in another post, stay tuned! There is no country that devotes more time to watching foreign foods being prepared on television than the U.S.A.. There is no country that investigates and welcomes foreign cuisines to the extent that Americans do, but we leave it up to restaurants and chefs to do the cooking. How does this relate to Alex Hawkes and his ‘South Florida Cookery‘ (1964) cookbook? 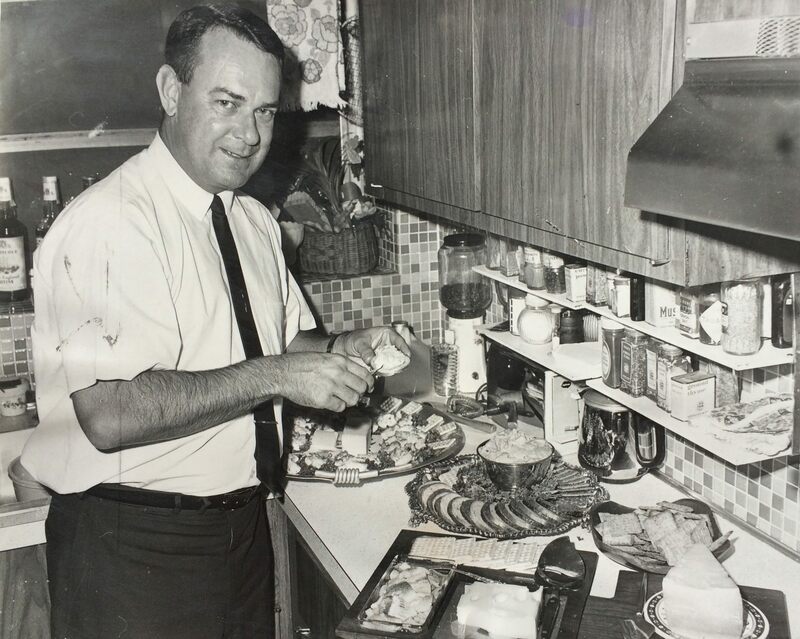 Simple, Alex was showing us that the cuisines from all over the world simply tasted better when prepared at home with a good recipe and quality produce, such as the bountiful heaps of fresh Florida fruits and vegetables that were abundant in markets of the 1950s & 1960s. Times haven’t change in Florida, and the farming networks although some say are diminishing, are at least for now providing quality produce all across the states. Historically, Florida “The Sunshine State” has proudly served winter cooks with splendid harvests, when most of the country is having snow pile on their yards. Many Americans and Floridians are unaware that the great “Sunshine State”, was and still plays an integral part in the agricultural network of the U.S.A., not just in the winter, but all year long. Alex shared a variety of recipes, often times his newspaper food columns were seasonally themed which was fitting, since they were titled ‘Florida Cookery’ and ‘Sub-Tropical Cookery’. Alex also played another role for those that wanted to experience culture through cooking and explore the world via fruits and vegetables, by enjoying foreign fare that they cooked themselves at home. Here’s some of the cuisines found in ‘South Florida Cookery‘ (1964) aside from Alex’s American interpretations, international delights & his personal culinary creations. Recipes for Haitian, Jamaican, Bahamian, Cuban, Spanish, Mexican, Puerto Rican, Nicaraguan, Argentine, Brazilian, Italian, Japanese, Nipponese, Chinese, Korean, Indonesian, Javanese, Indian, French, Hawaiian, Singapore, Philippine, Burmese, Lebanese, Turkish and Syrian dishes are offered. Alex D. Hawkes was a character of sorts, a cross between Julia Child and Anthony Bourdain, befitting since he travelled the world as a botanist, pleasing his palate and returning back to the U.S.A., eager to share his discoveries with fellow Americans, as did Child. Here are three full shots of the four known hand bound covers by Wake Brook House of ‘South Florida Cookery‘ (1964). The fourth cover is partially visible on the photo displaying the stack of some of Alex’s cookbooks. Catch you in “The Tropics”. A list of Alex D. Hawkes’ published works can be found via this link. – More books! For more information about Wake Brooke House visit David Burkam’s website on the subject. Click this link. Have a copy? Let us know! For anyone with a copy of George S. Fitcher’s The Florida Cookbook (1973) don’t forget the egg yolks! Published by E.A. Seeman Publishing #RecipesLost #RecipeTypo #RecipeTypos #KeyLimePie never uses Persian Limes!